Farm to institution is a component of the local food movement, representing the growing link between local producers and organizations like schools, prisons, and hospitals. These are organiza­tions that have concentrated buying power and thus a sizable influence on local food supply chains. Farm to childcare represents a next step in farm to institution, serving young children at the apex of their habit formation and biological devel­opment, and providing economic opportunities for local farmers. Using a qualitative case study meth­od­ology in one urban county in North Carolina, this paper asks the questions: (1) How do childcare centers, farmers, and distributors negotiate the tensions between social and financial values in the farm-to-childcare initiative? and (2) What strategies do these supply chain actors use to overcome bar­riers? 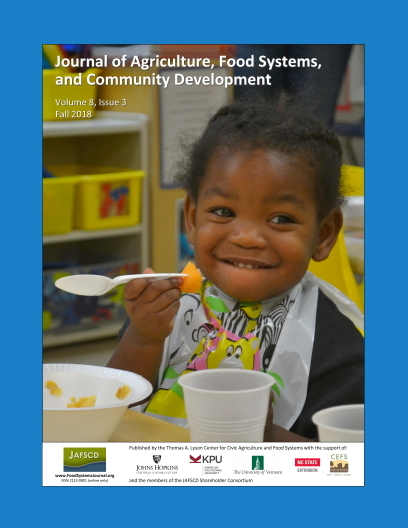 Analyzing the perceptions of participation in a farm-to-child­care project of 11 childcare cen­ters, 11 farmers, and four distributors shows paral­lel values for children’s health and community con­nections to farmers actualized in the relation­ships and pur­chase of local foods. However, market-driven values and actions dominated the supply chain for all participants when business solvency seemed to be in opposition to central social com­mitments. Childcare centers and nonprofit distribu­tors sub­sidized local food purchases with inexpen­sive, nonlocal food and grant funding, respectively. Many farmers preferred expressing social values through noncommercial activities rather than sac­rificing economic viability to participate in socially oriented programs. This study suggests that achiev­ing the social goals of farm-to-childcare programs requires creative strategies, such as coordinating sales of smaller than Grade A produce, purchasing from multiple local sources, and aggregating demand from multiple centers.